I have to tell you, thereâ€™s nothing that irks me more than false advertisement. Even if Cavolo tells the the reader right at the beginning that this is just a collection of his 101 favorite (or essential to him, at least) artists. 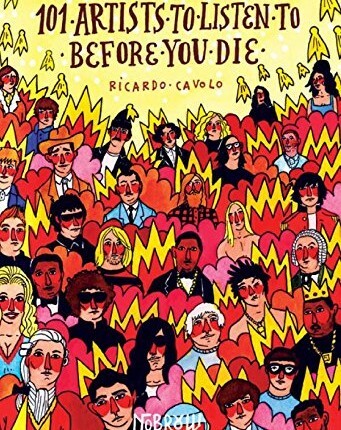 Whatever the case may be, 101 Artists to Listen to Before You Die is not what it claims it is, and Cavolo himself admits it. What this book is is a collection of 101 artists who have really inspired Cavolo in his life, all documented in the style of a journal. Each artist has a page where they are portrayed in Cavoloâ€™s artistic style with primary colors and weird shapes on their cheeks for some reason. A subsequent page contains a couple of paragraphs outlining why Cavolo thinks this artist had such an impact on him. I’ll admit itâ€™s pretty impressive that Cavolo finds something new and original to say about each artist. In addition, thereâ€™s no denying the man has a broad range in taste and I will surely check out some of his recommendations, but that isn’t exactly the point. The problem (and the point of my problem with this book) is that, like all of us, Cavolo has some pretty embarrassing taste and puts on a pedestal artists that actually have had a detrimental effect on music; who either have contributed to its elitist and exploitative elements, or who have played no role in the writing of their own music, or who are just plain laughably bad. Iâ€™m thinking of Kanye West, Jay-Z, MIA, and Kriss Kross, just to name a few. Thereâ€™s plenty of other questionable entries in this book, mind you. So basically, at best this book is one personâ€™s recommendation of some music for those who are interested to read about it to check out: some bad, some good. But essential? Not really.